The past year has brought more competition to the Toronto taxi business. With newcomers such as Hailo, Uber and TAG, long time favourites like Beck and Diamond have had to step up their game by building a smartphone app. Beck launched their iPhone app last May, now it’s Diamond’s turn. 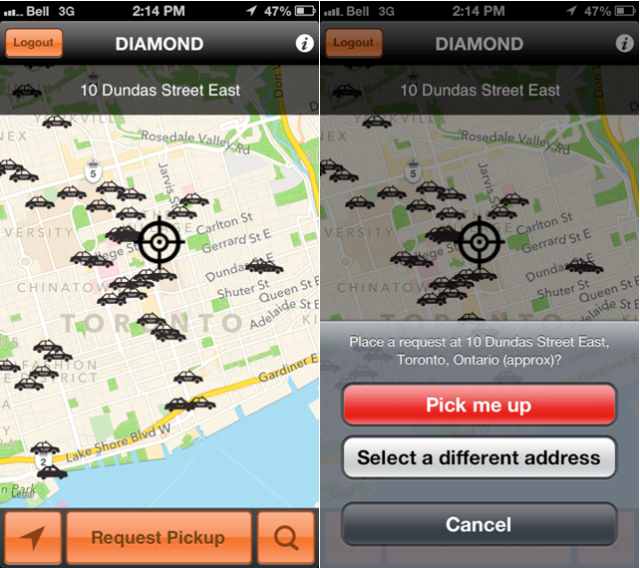 The company has officially released the “Diamond Taxi Toronto” app and is currently compatible with the iPhone, but will be coming to Android and Blackberry 10 later this Spring. As for the features, the app uses GPS to locate nearby taxis, plus you can request a taxi at a specific location and also see where where your taxi is in realtime. In addition, once your Diamond driver has arrived they’ll give you a notification that they’ve arrived… it can basically do everything except pay for your ride. The app also gives you the option to rate your driver. This app was designed by Toronto-based Fleetbit who noted that an app for Calgary’s Checker Transportation Group is in the works.